Horse Skijoring - Ski Joring - Skijouring - Jouring - Skikjöring - snörekjöring ~any way you want to say it or spell it! ANY EQUINE, HORSE, PONY, DONKEY, MULE, HENNY, MINIATURE, MAMMOTH ALL DOMESTIC AND SOME WILD <smiles> CAN LEARN TO PULL YOU ON SKIES! What Equine do you own now? Is your equine trained to ride. Good. Is your equine trained to drive. Better. Is your equine a kicker? Forget it. There will still be a bit of training involved before you should clamp on your skis and get behind it. If YOU can water ski, you are way ahead of the game! YOU are going to be able to really enjoy this Sport...if you can stand the cold weather. This Sport just might make you love the colder, snowy, weather! Skijoring is not new and horses are not the only type of animals that have and do pull a skier. 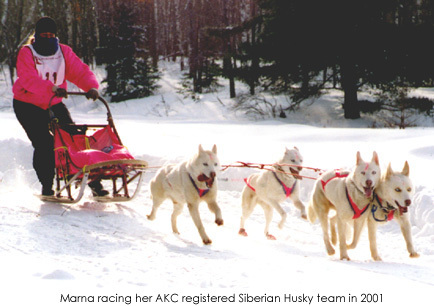 Please visit our Dog Sites (see links on the right, Sister Sites) for ideas and information, we also sell Dog Harnesses for Sled Dog Sports and more. 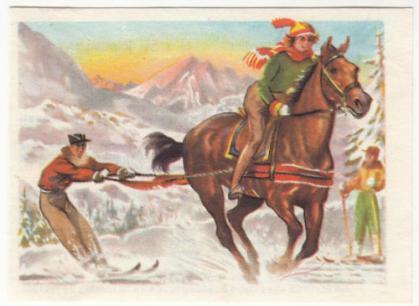 Reindeer, Dogs, Goats, Oxen and other animals have and do pull skiers. If you own one of these species but not an equine....keep looking for training ideas, and learn or keep skiing! 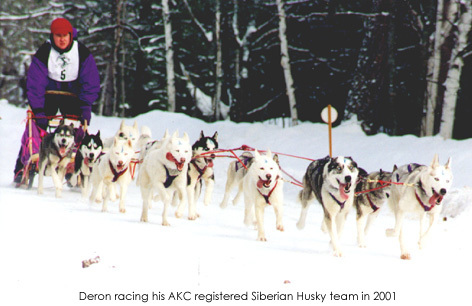 Many Sled Dog Races offer Dog Skijoring Classes....and those folks sure make the sport look easy. Horse Skijoring is NOT a New Sport. Horse Skijoring is World Wide, and very popular in Norway and Germany. 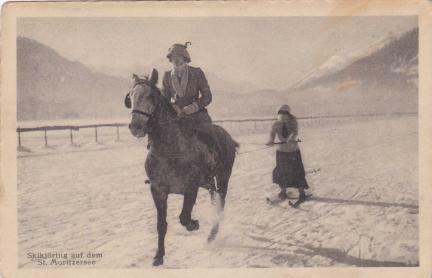 This is an old card from France, and an old photo from Switzerland. 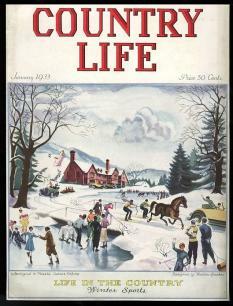 1933 Country Life Magazine Cover. Any time you work with equine, or are around equine, there are dangers. Equine are very strong animals and things can go wrong. WE ARE GIVING YOU IDEAS AND INFORMATION ON THESE PAGES ONLY. WHAT YOU DO OR DO NOT DO WITH THEM IS UP TO YOU. YOU AND YOU ALONE ARE RESPONSIBLE FOR YOUR SAFETY, YOUR EQUINES SAFETY AND THE SAFETY OF OTHERS WHEN WORKING WITH YOUR OWN EQUINE. WE ARE NOT THERE. WE CAN NOT SEE HOW YOU ARE TRAINING OR BUILDING YOUR EQUIPMENT! YOU ALONE ARE RESPONSIBLE! Think of it this way...the more you wear, the better padded you are if you should fall. But Mostly. You are going to be outdoors for a while. You will be grooming your equine, tacking it up, gearing up, having a great time, then after, ungearing, untacking, grooming your equine all this before you go back indoors. So Dress In Layers. Dress for the Cold! But Dress So That You Can Move About! Don't over dress, do not under dress or where clothing that is to tight to move with the Sport. At this point, in my opinion, Cross Country Skis would be best for this Sport. 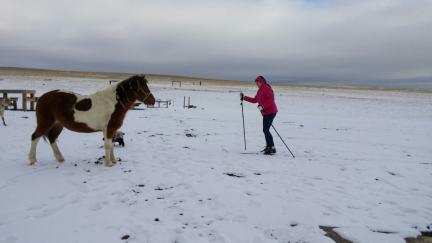 And you should know how to Cross Country Ski before grabbing onto an equine to be pulled. That said. I have seen people use Down Hill Skis, but I am sure, they are quite the skiers on Down Hill before and to be able to use them and stay behind the horse well. The BEST Skis are the ones that fit you well and that you can manover and hold an edge while skiing. GOGGLES OR SUNGLASSES! The equine will be kicking show and ice and such back right at you....some will hurt, but at least you will not/that is should not, get an eye put out if your are wearing eye protection. Gloves. You want to wear a glove that will allow you to Hang Onto the Tow Rope and or Handles. Leather or a leather padded Glove would probably be best. An all knit glove it going to make it tough to hold on...these will actually make the hanging on more slick. All of your equipment, including clothing, needs to fits you correct. Your Skis and Ski Boots need to be not only the correct size for your body fit, but also the correct size for the Sport. Shorter Skis might be better for some folks, longer skis for others. The trick is to be good at skiing and KNOW what you need before grabbing on behind a too fast equine and getting yourself hurt. Even ill fitting clothing can become a problem if it does not fit you correct or is not made for the sport you are trying to enjoy. Ill fitting overpants can 'take you down' if they are too tight or so loose that they trip you up. Gloves need to not only fit you correctly, they need to have grip to them so you can hang on! SERIOUSLY! THINK THIS ONE OUT LONG AND WELL. SAFETY FIRST! What works for one person may not work for another. Several people use a Saddle to tie into for their anchor to the horses power. Other people use Harnesses and some just use a Breast and Collar Surcingle. Whatever you do, use a Breast Collar of some sort for better stability and correct pulling area for your horses body. If you use a saddle, keep the ropes/straps tied low. Put a Breast Collar on the horses. If there will be a rider on the horse as you ski, USE YOUR HEAD AND MAKE SURE ALL IS SAFE FOR THAT RIDER. You can secure your ropes in several ways. Think it out. Set your ropes so that the rider would not get tangled in them if the rider were to fall or the horse was to circle around and get the rope around it. 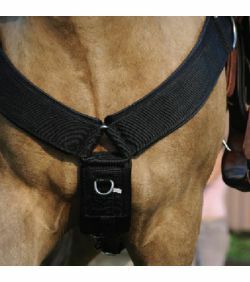 Hooking the Tow Ropes to the BACK of the saddle may be the safest way for both the rider and skier, as well as the equine. It is common for people Ski Jouring with dogs use a belt that tie them to the gangline/team. I really do NOT recommend this with Equine. You will need some sort of Tug Line or Loop Shafts to hang onto....and be able to drop quickly. Shoes or No Shoes, Studded Shoes....there is a lot to think about. 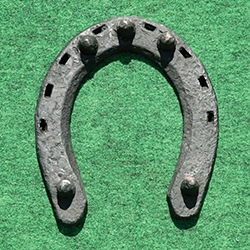 Most equine do NOT wear metal shoes in the Winter Months. But if your's does and you want to Skijor, Shoes are something to think about....unless you are only Skijoring at home once in a while. BAREFOOT IS BEST! Deron and I beleive that equine are best left barefoot and trimmed correctly for foot movement....but if your equine does wear shoes, and you keep them shod all Winter....TAKE CARE OF THOSE FEET! If you Skijor a lot, if you compete at Skijoring, you might want to think about a Winter Sport Horseshoe. Be sure to clean the balls of snow out of your horses feet frequently. Before and After Winter Events, pick out those hooves. BREAST COLLARS: If your horse is pulling it should have on a Breast Collar. A thicker, padded one is best. 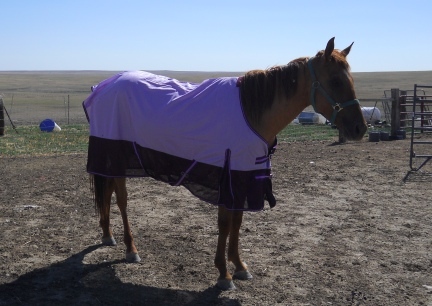 If your horse is riding in a Horse Trailer in the Winter, it should at least wear a "sheet". If your horse is competing and traveling, you will want a nice blanket and Shipping Boots. Some type of Leg Wraps are a GREAT Idea for the Competing Equine. GROOMING BRUSHES FOR LONG HAIRED SWEATY EQUINE COATS. 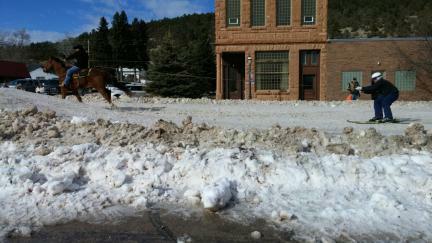 NEVER LOAD A SWEATY HORSE IN A HORSE TRAILER AND DRIVE DOWN THE WINTER HIGHWAYS...OR EVEN ROADS. YES. YOUR HORSE WILL NOT ONLY BE COLD, IT IS NOT GOOD FOR THEIR MUSCLES. Groom and Dry your equine before loading them up. Of Course you do not have the equine pull you while you hang onto the reins. So what do you do about being in control and still have a place to hang onto the equine? Here's what we did. 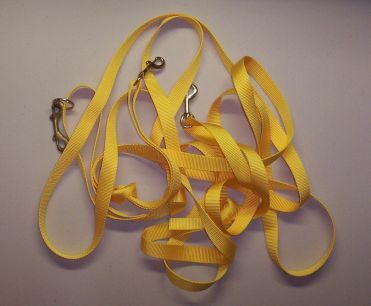 If you are making your own Long/Driving Reins you will need a good sewing machine, good heavy weight thread, and to go over your stitches at least 4 times. 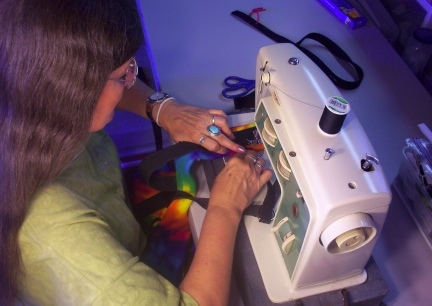 This is a photo of me (Marna) adding padding to the Harness we have. When I made the Reins, I sewed the Box Stitches at least six times, each row. There are many ways to make safe Loop shafts. This is how we did it. 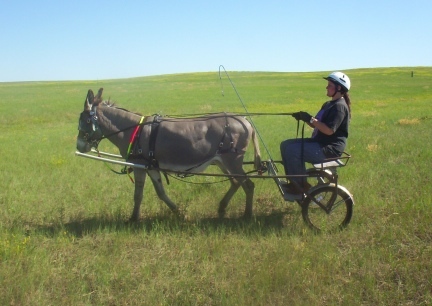 The first set we made was for training our donkey, Abby, to pull/drive, you can see it in the photo and I will tell you, it worked GREAT! These could be made the Skijoring size you wanted for training, ours, for Driving Training, was made shorter and wider than what we made for our Skijoring Loop Shaft. We make our Training and Skijoring Shafts out of 1 1/4" PVC Pipes and Parts. You can buy these in the Plumbing Dept in Hardware Stores. It is NOT expensive or hard to work with. Do buy the glue that goes on so that the pieces stay tightly together. I will start with the measurements used for our 12.3 hh Pony. You will want to measure and decide how YOU want YOUR shafts to fit before buying your PVC. Our Loop Shaft has the fabric/flag over the back end near the skier to stop at least some of the ice and snow and maybe on not so thick snow day, mud from being kicked back onto the Skier. THE TEST BEFORE LONG SKIS ARE HOOKED TO YOUR FEET! Having an equine pull a sled is also a ton of FUN! 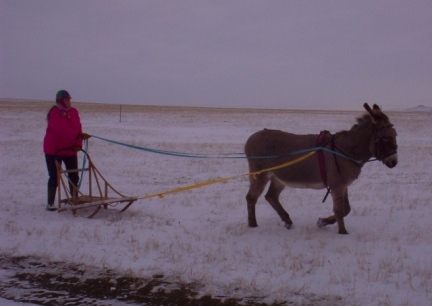 But it is also a great way to train, or test your Driving Horse, before putting long skis on and giving Skijoring a whirl. Make sure the Sled is back away from any kicking your equine might do...any equine. Make sure your head is NOT lined up for a swift kick. This is my Pony, Dream Maker. This is the Equine I will first train for Ski Joring. I will start training her to Drive. Basic Driving Technics. 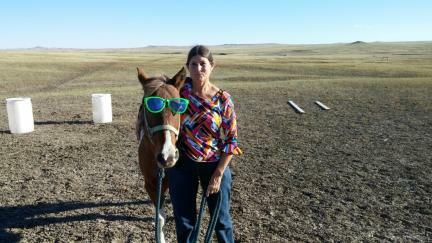 There are books and information on the Internet on how to train your equine to drive. 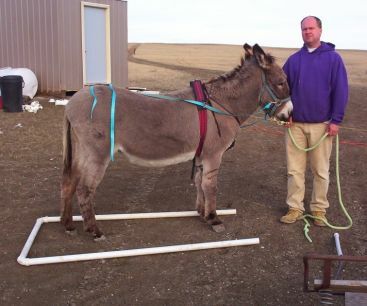 I have a page of how we trained our Donkey, Abby, to drive http://www.bibledonkeys.com/?id=264. Mostly I would tell you to take your time and train your equine correctly. This takes time. Take the time it takes for the equine you will use. KEEP IN MIND. AN EQUINE THAT IS 'DEAD BROKE' 'BROKE TO DRIVE' 'BOMB PROOF' CAN SUDDENLY SEE SOMETHING NEW AND SPOOK. SKI AROUND YOUR EQUINE BEFORE GRABBING ON BEHIND IT AND MAKE SURE YOUR EQUINE DOES NOT SPOOK AND SOMEONE GET HURT TRYING NEW THINGS! You might want to ski AROUND your equine before you hook to the equine wearing your skis....let your equine see and hear the skis. Blinders on your Equine Headgear is still a very good idea, but the more you can do to prepare your equine for SAFELY Skijoring behind it the better. If you have a friend that skis, ask them to take you out (no equine), and learn to Cross Country Ski. Go online and watch 'How To' Skiing Videos. Do Internet Searches and read all you can. PUTTING IT ALL TOGETHER AND SKIJORING! Yes. 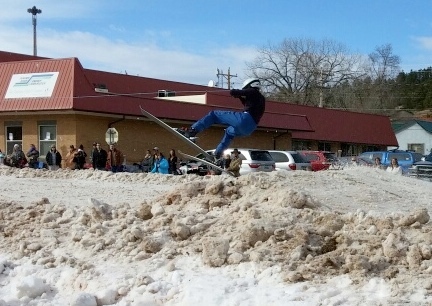 There is such a thing as Horse Ski Joring Competition. 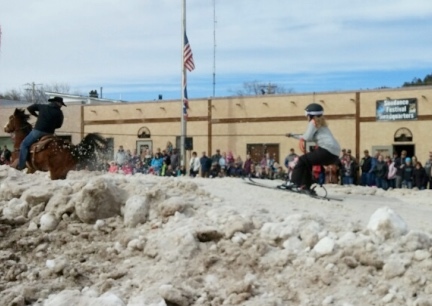 Out here in the West, Sundance WY has a Winter Festival each Winter and Equine Ski Joring is the highlight. There are also Horse Skijoring Competitions in CO and MT and I am sure several other States in the USA as well as Canada and other countries. You can google the information and look for Competition in a town or city near you. There are, of course!, clubs and rules and events. IF YOU COMPETE AT SKIJORING BEHIND YOUR EQUINE AND WOULD LIKE TO SEE YOUR PHOTOS POSTED HERE....PLEASE CONTACT US. 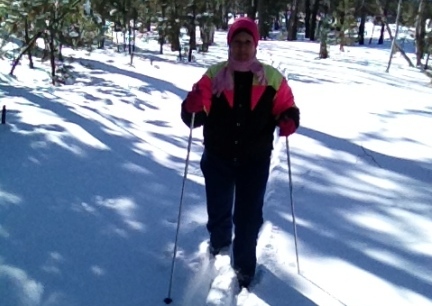 I went Cross Country Skiing with a friend for the first time in my life Winter of 2015 (the first half). I LOVED IT! I did ok. I started looking for Skis and Boots (used) right away after. 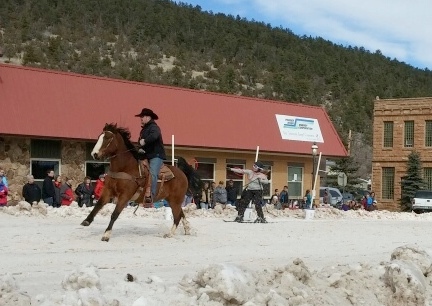 2016-02-20 Deron and I went to the Sundance WY Winter Fest with Horse Skijoring... we were afraid they would cancel with the weather warmer and all the snow melted away. When you look at the photos note that there is no snow other than Main Street. (and see it melting) <smiles> They trucked in and groomed a LOT of snow. THIS! OH HO! HOW FUN! EVEN TO WATCH WAS VERY EXCITING! You would have to know Deron to really appreciate this......but he wants to participate NEXT YEAR! 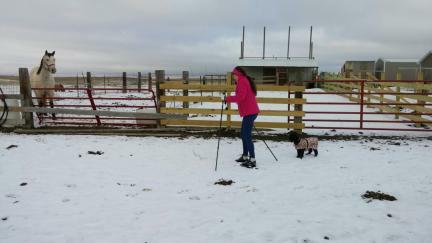 Not only do we not have a horse to do it (yet), so far in his life, he is not a SKIIER! He was a HECK of a Sled Dog Driver though! And since we spent MANY years driving, racing and training Sled Dogs, it is not too a far of a stretch for either of us. Seriously. For those that Ski.....OH MY! These Skiiers were jumping FOUR Jumps, going Through Cones on the other side/far side of the chute between each item, and gathering THREE Rings (Ring Jousting) and were Across the Finish Line in less than 17 seconds.....FLYYYYYING! (some less than 14 seconds!) All this while HOLDING a Rope tied to a saddle of a fast horse, moving it to either hand as they went, sometimes both hands. Very EXCITING. The contents of this page for Horse Skijoring - Ski Joring is still under construction. Please keep checking back.